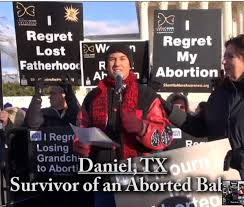 Forty-two years after the Roe V Wade decision legalized abortion in the U.S. a young man named Daniel Rosa stands at the steps of the Supreme Court and shared how abortion has impacted his life and family. Daniel’s testimony reveals that abortion can never be a private personal decision. Daniel share’s about his father’s abortion and the loss of his brother David. The brief story reveals the truth of how the Abortion Shockwaves touch not only the mother, but father and siblings of an aborted child…it is truly a family wound. This testimony is also a poignant account of the great blessing when a father in humility acknowledges that at a time of darkness and weakness he made decisions that hurt his marriage, family and took the life of Daniel’s sibling. But also see in this testimony, a son who continues to have the deepest love and respect for his father. Daniel’s father models for his son that yes, a man can fall into darkness and make tragically bad decisions. But his Father’s story also serves as a warning to his son to value the precious gift of human sexuality and human life. If you fall, being a real man means having the courage and humility to honestly face your failings. With God’s grace and with the help of others you can find healing and peace for yourself and your family. There are many untold stories flowing from the Shockwaves of abortion that end much differently… in dysfunction, death and disintegration of marriage and family relationships. Consider how many fathers engage in affairs and facilitate and at times coerce their partner’s abortions to cover up their secrets and lies. Without healing they will continue to act out their sin and emotional pain in their lives and relationships placing their eternal souls at risk. The stakes could not be higher for our families and our nation. The first step is addressing one’s own abortion loss(es) in attending an abortion recovery program. This opens the door to a support network of clergy/ministers, counselors and fellow Christians who understand the post abortion journey of recovery. This network is essential as you begin the healing process for yourself and your family. Here is a video and written presentation of Daniel Rosa’s testimony. Please share this with friends, family and colleagues so others can understand the wider impact of the Shockwaves of Abortion on our families and society, and the hope of healing and restoration for those wounded by abortion loss.